Tour director, biologist Tom Goodwin, has overall training and experience in the fields of marine and wildlife biology and graduate studies in environmental education. Tom began his career as a whale-guide in Newfoundland in 1980, where he spent five seasons. He was also involved in studying whales and releasing them from fishing nets in which they were accidentally entrapped, risking his life underwater many times. Captain Goodwin has successfully completed a captain's course and safety training exceeding the requirements of his business. 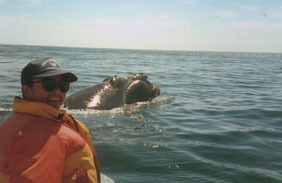 He is probably the most experienced and qualified whale-guide in Nova Scotia. You may however, travel with one of his trained staff. 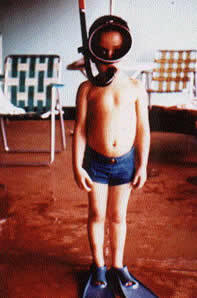 Tom has been fascinated by the sea since a young boy. 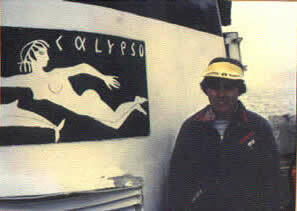 He was a founding year (1975) member of the Cousteau Society and has worked with the Calypso crew. 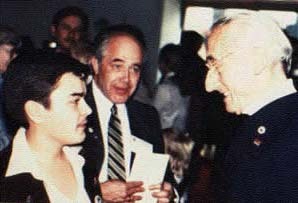 He was also a charter member (1983) of the Society for Marine Mammalogy, and has been supporting the World Wildlife Fund for over 35 years. 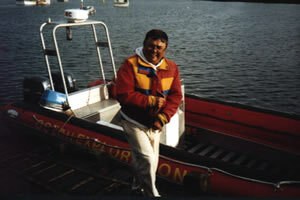 Tom served all executive positions of the former Nova Scotia Adventure Tourism Association. 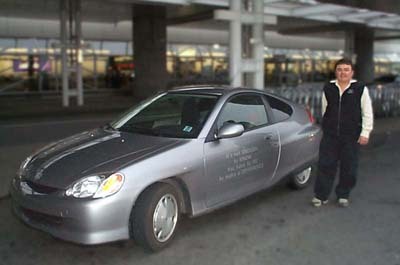 Tom and his Honda Insight ("Ultra Low Emmission Vehicle"). It's not ENOUGH to KNOW, you have to DO to make a DIFFERENCE!